To get ready to drink this beer, we imagined ourselves in a barbershop quartet from Skokie Illinois. For those of you that don't know, that's a nod to the fine film 'The Usual Suspects', in which Kevin Spacey plays the villain Kaiser Sose. 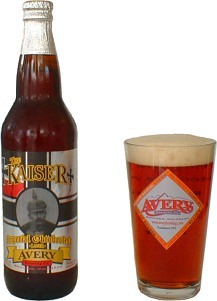 The Kaiser pours a beautiful caramel color with a fizzy, light-brown head thats full of fizz. The head faded quickly, as does the lacing as we rotate our glasses. Aroma is full of an excellent maltiness that harkens us back to Saturday mornings eating thick French toast slathered in maple syrup. Initial taste is loaded up with sweetness that continues right through to the finish, introducing an alcohol heat. Light to medium bodied, it has a creamy texture with an astringent tinge. Reviewed on May 15th, 2007.